I’ve had this shrub growing at the back edge of my prairie for as long as I can remember, and I’ve never really noticed it much. It’s in the hedgerow we’ve created to camouflage the industrial park that lies beyond our property. 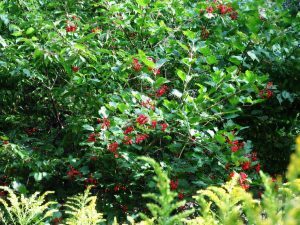 But this year there is a profusion of red berries which drew my eye to this shrub. 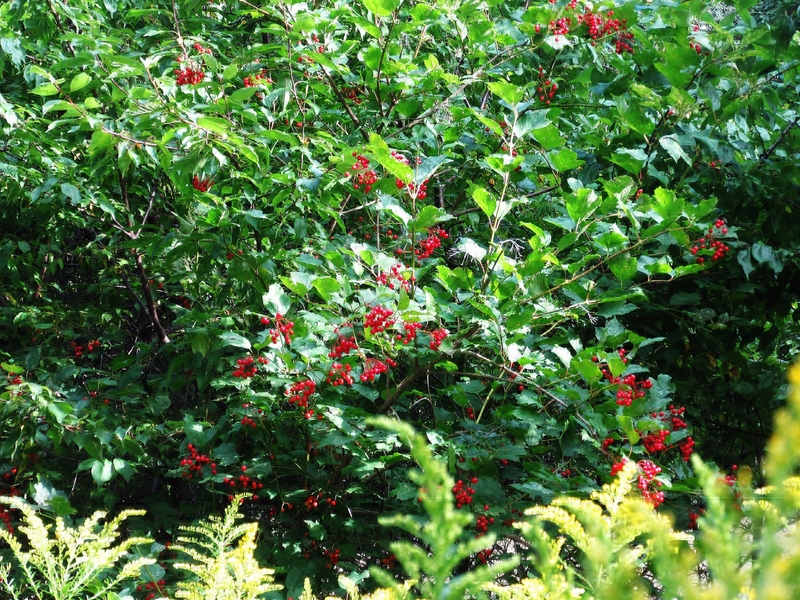 Not sure why there are more red berries this year — all that extra rain, I guess…. I’ve had this shrub growing in the front of my hedgerow for just as long, but over the past few years it has seemed to be dying out. But, oh no, not this year. Some of the shrubs came back, once again giving us that beautiful display of red stems that show off the white berries. All that extra rain, I guess…. 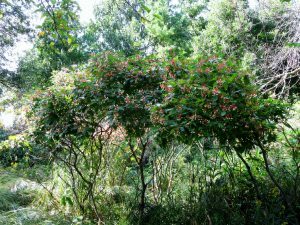 Hedgerows typically consist of a tangle of trees and shrubs and forbs and grasses that yield seeds and nuts and berries, making it a complete ecosystem. Sometimes you’ll even find an old fence or stone pile somewhere in the middle to complete the habitat. Most of the hedgerows that used to grow haphazardly around the countryside in America are now nearly a thing of the past. Because of the current emphasis on growing corn, every extra piece of land is being used for agriculture. So it’s up to us — the public — to provide as much habitat as we can for the birds and pollinators and mammals that depend upon it for a food source and nesting area and protection from the elements. If you can provide a stopover habitat for our friends who migrate or a comfy habitat for our friends who stay for the winter, you’re one of the good guys and we all thank you very much.